Since the departure of Chef Reyes back in May, I've been skeptical about Sparrow and have only been there a handful of times. However, more and more I've been hearing great feedback about its continued excellence, with respect to burgers especially. Dan and I went there on Saturday night to test how everything--the burgers in particular--measured up. Overall, we were pleased but were just slightly miffed at the slow service and the steep prices. The Burger - Both Dan and I ordered a medium burger. 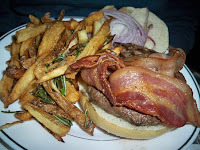 I got mine with gruyere cheese and salad, while Dan chose the bacon and herbed fries. Enjoying mine very much, it took me back to the days of Reyes, which made sense, as his successor is a close childhood friend and apprentice. 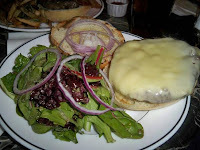 The burger was tender, juicy and flavored with quality herbs. I liked that it was the perfect thickness, substantial enough to fill you up but not so thick that you couldn't take a bite. The bun was a good gripping tool--fluffy, buttery and delicious but not overpowering, thus letting the meat take center stage. Dan's only complaint was about the bacon--it wasn't crispy enough and just didn't do much for him. The fries however, were zesty, crunchy and plentiful--two thumbs up! Our slow service was the result of one waitress tending to the entire place. She was friendly and nice but unfortunately had a hard time keeping up with the increasing crowd--and who could blame her. She was sweet and apologetic for the delay and even treated us to drinks, which was generous. While the prices are not outwardly expensive, they add up quick. Our burgers were $9.50 each without the toppings and with everything added together, we paid about $32 for two burgers, which was a bit much. I'm of the $10 or less burger school. That Burger looks Delicious... I need to visit Astoria more often.